No more than only 2 parts in 10,000 trillion -- that's the new world record set for the frequency variation by the most stable laser as reported in an advance on-line publication in Nature Photonics . The laser is developed and tested by an international collaboration of scientists at NIST/JILA in Boulder, Colorado, USA and a group at Physikalisch-Technische Bundesanstalt (PTB), the German counterpart of the National Institute of Standards and Technology (NIST). Their work represents a new approach for constructing high-quality optical cavities that will bring more than an order of magnitude improvement over prior designs. In particular, it will accelerate progress in development of optical clocks, which operate at frequencies more than 10,000 times higher than the approximately 9.2 GHz microwaves used as the basis of the current worldwide time standard. In addition, the novel laser design is expected to usher in a new level of precision to research in gravitational wave detection on Earth and in space, and precision tests of relativity as well as fundamental physics research in cavity quantum electrodynamics and quantum optomechanics. “The previous stability limit of about 2 X 10-16 was good,” says study co-author Jun Ye of JILA and PML’s Quantum Physics Division. “But it prevented us from exploring the full potential of modern optical atomic clocks where the atomic coherence time can be exceedingly long. The potential of pushing the laser stability better by an order of magnitude will allow us to realize atomic clocks that have unprecedented stability approaching 1 x 10-17 over 1 second. “It will also have a dramatic impact on large-scale precision measurement instruments such as space-borne optical interferometers for gravitational-wave detection with baselines of many thousands of kilometers. And it may be of intense interest to the communications industry, since our system was tested at a familiar telecomm wavelength of 1.5 micrometers.” That is the wavelength with the lowest loss in fiber-optic networks. Research on ultra-stable lasers typically employs some kind of optical-cavity interferometer, comprising a spacer with mirrors at each end. 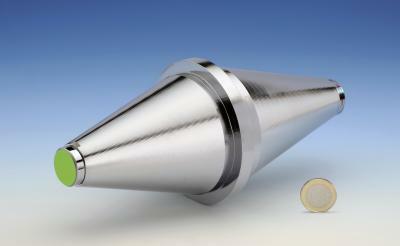 That design severely restricts the range of optical frequency which can resonate in the cavity. By superimposing the cavity output beam on another highly controlled reference beam, the interference effects (periodic reinforcement “beats”) can reveal stability with exquisite sensitivity. Such systems, however, have historically been subject to thermal fluctuations that alter the cavity dimensions, and hence reduce frequency stability. Single-crystal silicon has a coefficient of thermal expansion that approaches zero at 124 K, “so an all-silicon interferometer can be made insensitive to temperature fluctuations” at that point, the authors write in Nature Photonics. In addition, at 124 K the crystal has a much lower mechanical loss compared to conventional optical glass, and a much higher Young’s modulus. Both mechanical properties combine to minimize the fundamental thermal fluctuations. The group used extensive computer modeling to create a design that reduced the effects of environmental vibrations on the 21 cm long resonator, which they mounted in a vertical configuration after testing its response to external forces in all three dimensions. 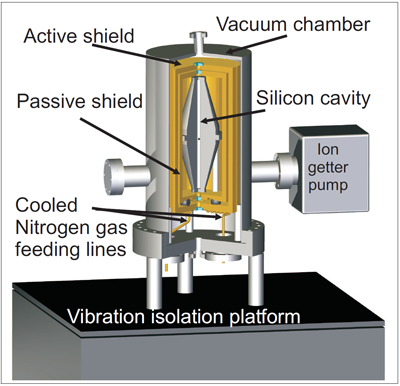 Finally, the German researchers devised a novel and simple cryostat design using evaporated liquid nitrogen gas as the coolant. The gas flows through superinsulated vacuum tubes to an outer heat shield, and careful control of the flow limits temperature deviations in the system to about 1 mK from the 124 K target. Diagram of the device interior [image credit: Thomas Kessler, Physikalisch-Technische Bundesanstalt, Germany]. The new all-silicon unit was tested for 24 hours against two of the best-performing conventional ULE-based optical cavity-stabilized lasers – one from JILA and one from PTB, with thermal noise variation in the range of 6 X 10-16 and 2 X 10-16 respectively. 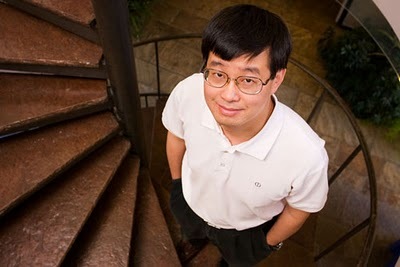 The results, Ye says, “show that the all-silicon system surpasses the performance of any other optical cavities ever reported.” As a long-term stable frequency reference, a preliminary test has shown that it is equivalent to the stability of a hydrogen maser at time intervals up to 1,000 seconds. The scientists are already at work to improve those figures. Among other modifications, they will attempt to reduce feedback errors due to spurious amplitude modulation, suppress noise from the cryostat, and experiment with different optical coatings on the silicon mirrors. 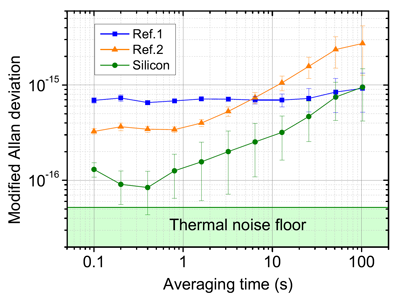 The very thin optical coatings now remain the only significant contribution to the thermal noise of the cavity and new approaches are already being investigated jointly with Markus Aspelmeyer’s group at the University of Vienna. Graph comparing average instability over time of the new design (green) to two ultra-stable ULE units: Ref. 1 (blue), a PTB laser, and Ref. 2 (orange), a JILA laser [image courtesy: NIST, USA]. Many of most critical experiments in atomic physics require lasers with extremely narrow linewidth and extremely stable output to interrogate clusters of ultracold atoms or single trapped ions. “Stable lasers such as the one reported are already unlocking some of the mysteries of minute atomic interactions that are otherwise hidden,” Ye says. T. Kessler, C. Hagemann, C. Grebing, T. Legero, U. Sterr, F. Riehle, M. J. Martin, L. Chen, J. Ye, "A sub-40-mHz-linewidth laser based on a silicon single-crystal optical cavity", Nature Photonics (Published online September 9th, 2012). doi:10.1038/nphoton.2012.217. Abstract.